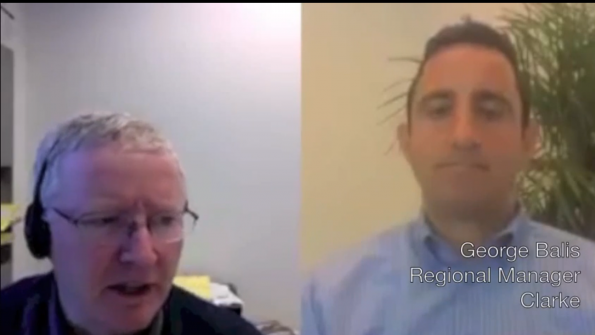 Government Product News' Michael Keating sits down with George Balis, who is a regional manager at Clarke. Balis discusses mosquito abatement trends and abatement programs in cities. A couple of factors, such as the increasing number of organic farms and gardens and growing environmental concerns are leading to more regulations covering mosquito abatement, says George Balis. He is a regional manager at Clarke and an entomologist by training. Clarke is a global environmental products and services company. It is a family-owned business based in St. Charles, Ill. The firm develops and delivers environmentally responsible mosquito control and aquatic services to help prevent disease, control nuisances and create healthy waterways. In this video interview, Balis discusses the need for mosquito abatement around the U.S., and how the process and techniques can vary from region to region. In the interview, Balis offers advice to for government administrators on setting up an abatement program? First, he says, government officials should assess their financial capabilities and staffing levels. Eight Illinois towns have joined with other communities to launch a mosquito control program that relies on the EarthRight abatement process from Clarke. EarthRight is the first public health mosquito control program that uses two materials registered with the U.S. Environmental Protection Agency and listed with the Organic Materials Review Institute (OMRI). That means the materials have been approved for use in and around organic gardens and farms. One product controls larvae and the other, adult mosquitoes. In the EarthRight process, abatement crews use bicycles and hybrid cars that transport bike crews into the communities to apply the materials. According to Clarke, using green transport vehicles helps drive down the program’s carbon footprint. The photo to the right shows a Clarke technician deploying the Natular larvicide into a storm drain’s catch basin. Clarke’s Balis says that the EarthRight sustainable mosquito control program can help communities reach their environmental goals. “It helps cities, counties and other governments create an integrated, multi-step program for larval and adult mosquito control,” says Balis. In the video, George Balis discusses sustainable mosquito control.